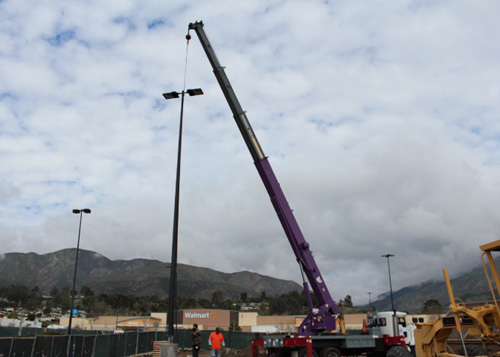 This installation job in Highland, California, features our 35-ton Terrix boom truck setting 25 foot light poles in a Wal Mart parking lot. 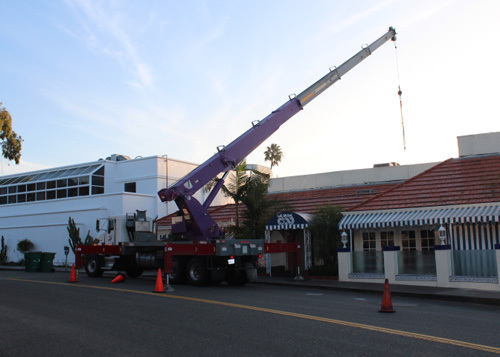 We lifted a 1,200 pound AC unit onto the roof of the Las Brisas restaurant in Laguna Beach, California using our 35-ton Terrix boom truck. This replacement job in Los Angeles, California, features our 135-ton Dynalift boom truck setting a 500 pound air conditioning unit on a 125 foot tall building. We safely maneuvered a 5,500 pound scissor lift into a hole of the roof of this waste disposal plant in Torrance, California, using our 35-ton Terrix boom truck. Using a two-person man basket attached to our 22-ton Manitowoc Boom Truck, a serviceman is able to install a business sign for Dr. Butchko's Veterinary Hospital on a new building in Riverside, California. The city of Yorba Linda called us in to help with a vehicle accident in a residential area. Using our 75-ton Linkbelt hydrocrane, we were able to safely lift a 5,000 pound car from a home's pool. We installed 600 pound solar panels onto the roof of a Diamond Bar home using a 22-ton Manitowoc boom truck. This lift was approximately50 feet away from our truck. Using our 75-ton Lincbelt boom truck, we lifted 1,200 pound panels up to create the roof of this dome-shaped building in Loma Linda. As we steadily maintained the lift, contractors bolted them in place. We lifted this 500 pound air conditioning unit onto the roof of a home in Hollywood Hills, California, using our 35-ton Terrix boom truck. This lift was approximately 75 feet away from our boom truck. With one of our drivers operating our 22-ton Manitowoc boom truck, a serviceman in an attached two-person man basket was able to change the bulbs on light poles in a commercial parking lot in Riverside, California. This lift job in Torrance, California required us to lift 1,000 pound steel beams up 35 feet and in 45 feet. Using our 35-ton Terrix boom truck, we were able to safely place the steel beams on the roof of this waste disposal plant. This lift job in Anaheim, California, features our 22-ton Manitowoc boom truck lifting a 500 pound grill hood 60 feet up to the third story balcony of the Honda Center. We placed these pieces of decorative art in front of luxury apartment homes in Brea, California using a 22-ton Manitowoc boom truck. Each art piece we lifted was 700 pounds each and needed to be placed on concrete columns 2 feet wide. This was an AC replacement job at the Las Brisas restaurant in Laguna Beach, California. 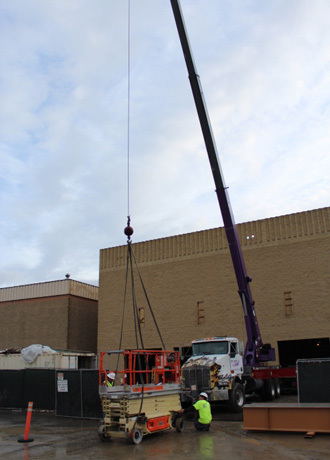 We removed the first unit and replaced it with a 1,200 pound air conditioner using our 35-ton Terrix boom truck. The lift was 15 feet high and 70 feet from our truck. This lift in Chino Hills, California, features our 75-ton Lincbelt hydraulic crane performing lifts approximately 140 feet away. We lifted hundreds of stones ranging in weight from 2,000 to 5,000 pounds for a water fountain at Baps Chino Hills Hindu Manir Cultural Center. We placed the stones in a design between the water jets. Using our 35-ton Terrix boom truck, we were able to set a steel canopy for a winery in Temecula, California. The steel canopy was comprised of 30 individual parts, and altogether was 1,000 pounds. Our operators carefully lifted each piece 20 feet high and placed it approximately 50 feet away where contractors designated. This replacement lift job features our 22-ton Manitowoc boom truck setting a 500 pound air conditioning unit on top of a home in Downey, California. This was a replacement job that required our operators to lift units 15 feet high and 60 feet across. We performed this lift for Erickson Air Crane in San Bernadino, California. Using a 22-ton Manitowoc boom truck, we were able to lift 600 pound helicopter blades off this Sikorsky S64 Sky Crane so they could be replaced with new blades.